According to a de-classified source named as “Research Into Use of Anthrax and Other Poisons for Biological Warfare”, British scientists dabbled with the possibility of using poisoned needles that could be laced with anthrax or even ricin pellets at their tips. 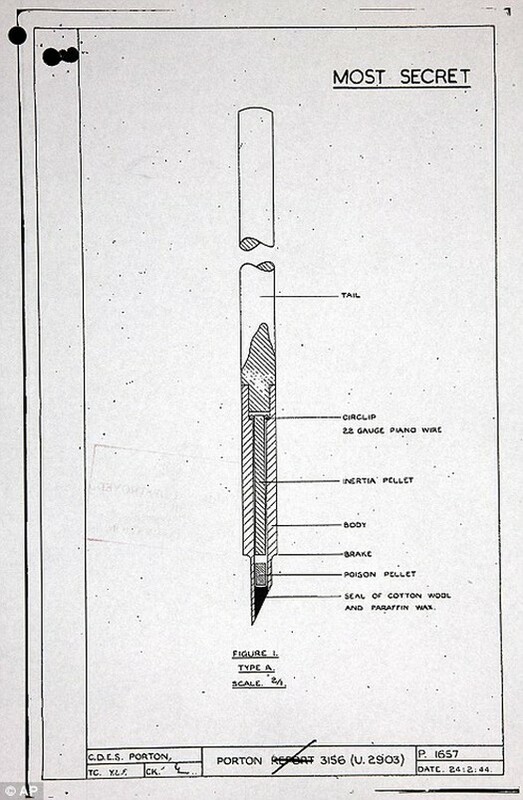 More than 36,000 needles could be accommodated within bombs, and their advantage was – even a small degree of their piercing inside the victim’s body would have spelled death for the person. The selection of the poisons ensured that the slightly penetrated victims couldn’t even recover afterwards in hospitals. But of course, in practical scenarios, the non-explosive shells were not expected to go through covers and shelters. In other words, the targeted enemy had to out in the open for the poisoned darts to work – which seemed both unfeasible and uneconomical. So, the secret project never left its planning phase. 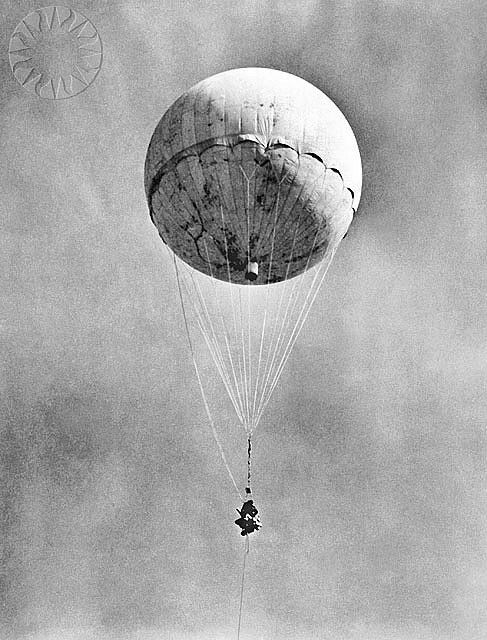 A ‘hydrogen bomb’ of sorts, the Japanese Fire Balloons (‘fūsen bakudan’ that literally translates to “balloon bomb”) were basically flying bombs attached to hydrogen-inflated balloons. The payloads and the bombs varied, ranging from incendiary bombs, anti-personnel bombs to even a pack of incendiary devices. As can be comprehended from these ingredients, the contrivances were designed as cheap yet destructive weapons. As per theory, the air-borne bombs would follow the natural jet stream (fast flowing yet tight air currents) across the Pacific Ocean from Japan to United States, and then explode around North American settlements, farmlands and forests. In terms of figures, there were over 9,300 of such bombs released from Japan from November 1944 to April 1945; but only 300 of them were able to cross into mainland United States, causing only small scale casualties and damage. Better known as Project Habakkuk, this oddball design concept originally came from the brains of British engineer Geoffrey Pyke. The idea was to create a gargantuan landing platform for Allied aircraft in the middle of the Atlantic Ocean – which would potentially give them a base for hunting down surfaced U-boats. 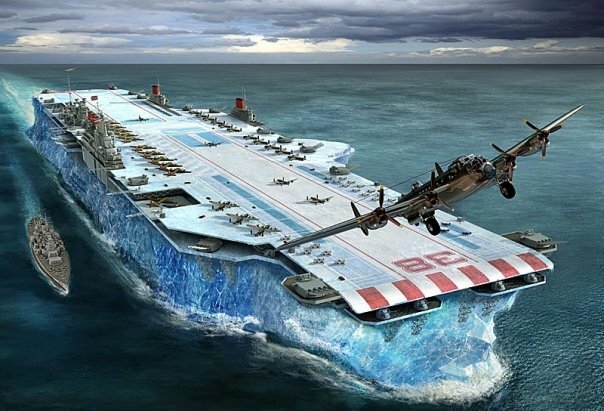 Two American scientist followed up the basic blueprint with an ingenious but bold solution – a 1950 feet long, 350 feet wide aircraft carrier that would be constructed from pykrete (a frozen mixture of 86 percent water and 14 percent wood pulp), with 3,590 crew members, built-in cooling system, displacement capacity of 2.2 million tons and the ability to shelter over 150 planes. Just for comparison’s sake, the largest ship in the world – Prelude FLNG, is around 1,600 ft long. Suffice it to say, the development plans were halted by 1944, after building a 60 ft long prototype. The official reasons given were mainly related to the high costs of the project and technical predicaments of maintaining the frozen state for such a humongous floating object. Looks familiar? 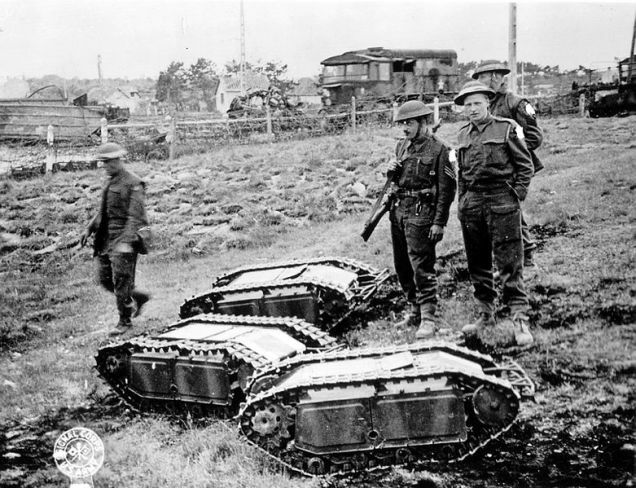 Well, what may seem like automated tracked robots used in our contemporary times, actually had their predecessor in the ‘Goliath tracked mine‘, designed by the Germans. Colloquially known as the ‘doodlebugs’ by Allied forces, these contraptions (with over 4,600 specimens being built) could carry 165 lbs to 220 lbs bombs, and traverse through undulating territory to reach enemy fortifications, formations and other strategic infrastructure (like bridges). As for maneuvering, the tracked devices were wire-controlled, and they would explode on impact with the targeted object. However, in spite of the advanced technology, the navigational part was cumbersome – which led to numerous botched missions. More importantly, their payloads were still not feasible enough for the complex mechanisms and labor that went into the process of manufacturing them. 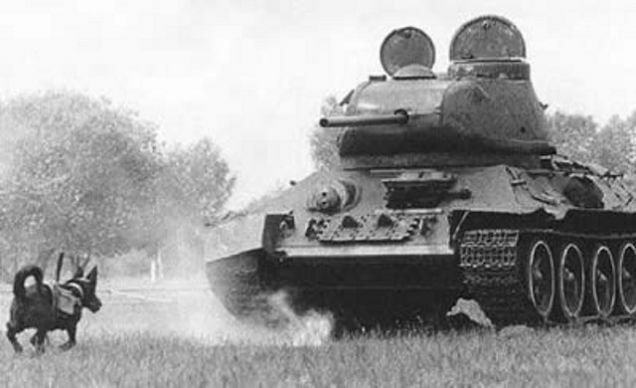 Perhaps the most ‘remorseless’ among all the weapons mentioned here, the Soviet anti-tank dogs were basically suicide bombers who were trained to find food under tank tracks. As a part of their merciless training program, the dogs were always kept hungry – and, so when the enemy tanks approached, they rushed at the bottom of the tank to salvage their elusive meal. The brutal working scope entailed a 26 lbs bomb being strapped to the dog’s body. So when the furry fiend dived under the tank, a special lever (emerging from the rigged pack) caught on to the hull, which lead to the detonation of the bomb, much like a mine. Now pertaining to real-time events, there are many sources that conflict on the effectiveness of such anti-tank dogs – with some claiming that the dogs were mostly afraid of gun-fire, that led them back to their handlers. However, other accounts (mostly Soviet) detail how the dogs were instrumental in destroying over 300 German Tanks – so much so that the German soldiers were ordered to shoot any dog on sight!